Overview of the options available for managing online payment options. All payment options that have been created can be managed directly from the "Online Payments" section in the Admin Control Panel. All newly created online payment options will automatically be placed in an active status and will be available for members on your website to log in and pay. To deactivate an online payment option, click on the green checkmark in the "Active" column, so it changes to an 'x.' This will place your payment option in an inactive status, meaning this payment option will no longer be available to your members. To reactivate the online payment option, click on the icon again, so it changes back to a green checkmark. 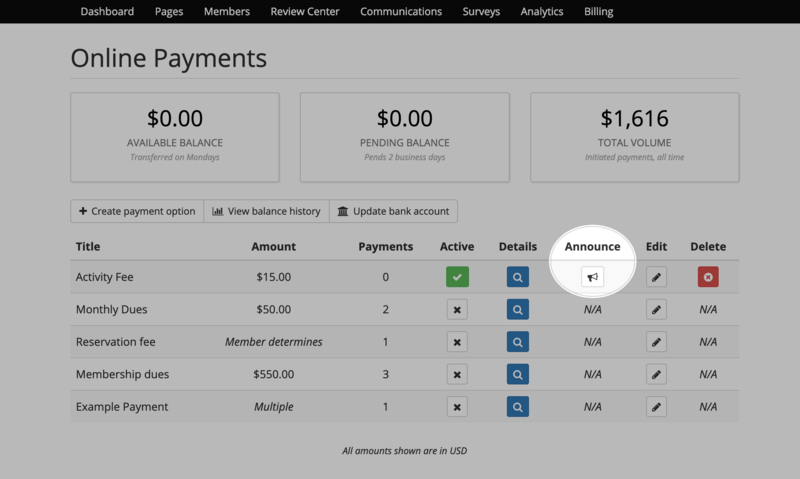 To view the details of a payment option, click on the magnifying glass icon under the "Details" column. In here, you will be able to see who made a payment, when the payment was made and transferred, the amount paid, and the payment method used by the member. You can additionally issue refunds from here and export all of the payment details if you need them for your records. You can announce an available online payment option whenever it's most convenient for you by using the announcement feature. 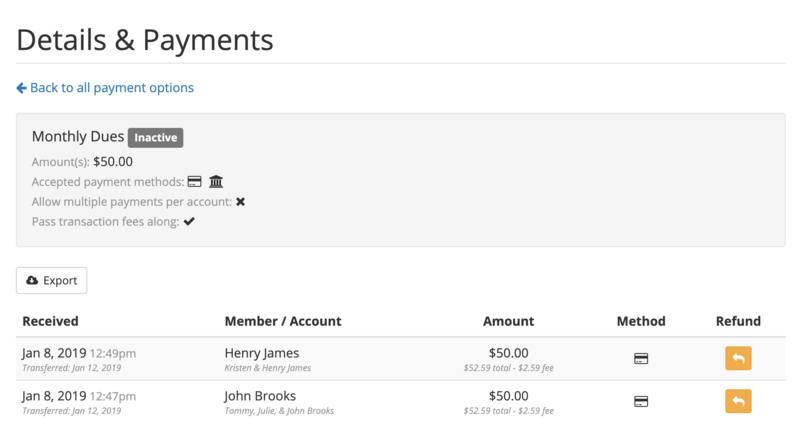 This is a great tool to use to prompt your members to make a payment directly on your website! 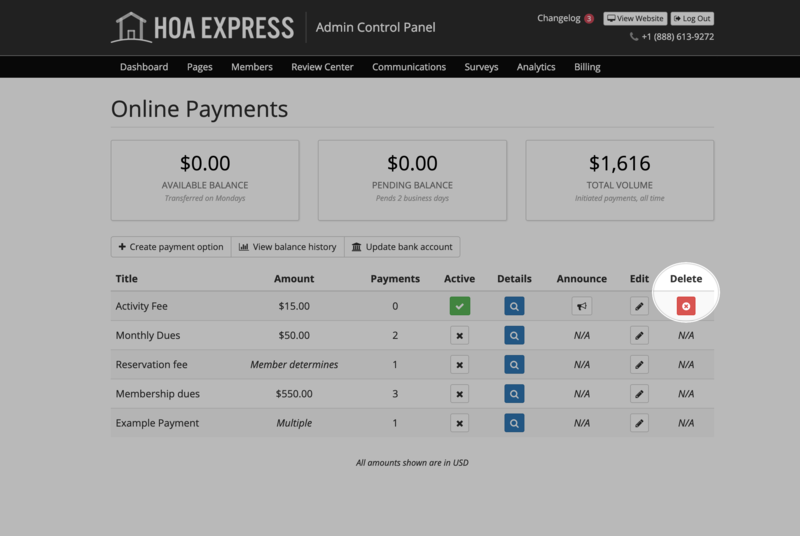 You can read more about how to use this feature in the following help article: Announcing payment options. To edit a payment option, click on the pencil icon under the "Edit" column. In here, you can update the title of the payment option, any notes for members, the amount type, accepted payment methods, the amount of the payment option (if applicable), and any of the optional settings. If you haven't received any payments for an online payment option, you will have the ability to go in and delete it. However, once it has received a payment, you will no longer have the option to delete the payment option.